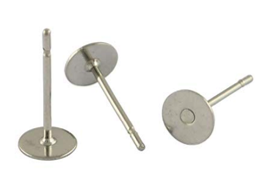 The touchpoints used in HyperDuino projects are actually earring backs. They have the advantage of being readily available from multiple sources, don't have sharp points on the posts, and many have a little "notch" on the post that makes for an even more secure connection to the sockets on the rainbow cables. We use the 6mm size, and if you need some quickly, you can find those and many others at Michael's Art Supply stores for about 5 cents each. 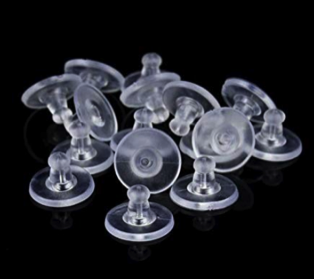 Larger bulk quantities (for example, 500 for about $11) of the touchpoints (flat post earrings) and silicone backs can be often found on Amazon and other sources. 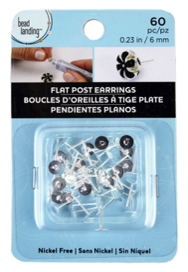 When attaching touchpoints to thin materials like paper or thin cardboard, using the earring backs can make for a more secure connection, and still leave enough room for the socket.